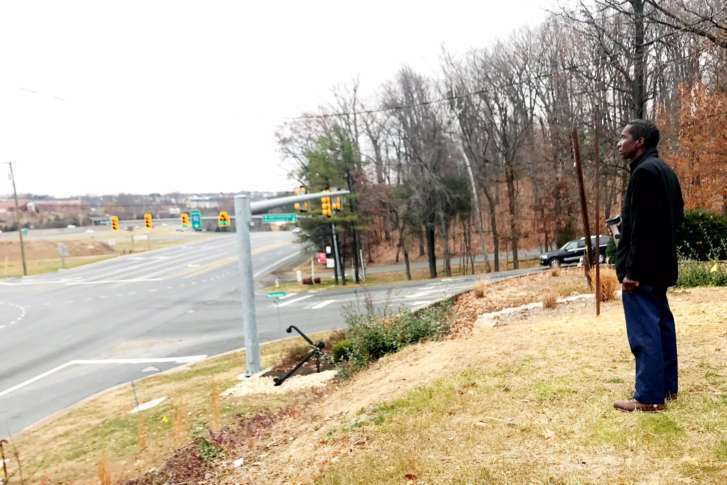 STAFFORD, Va. — Friday’s search in Stafford County for the body of Pamela Butler, who was murdered in D.C. in 2009, came to an unsatisfactory end, and her brother said he was told her remains may never be found. The D.C. police said in a statement that “The search for Pamela Butler remains an ongoing process,” and wouldn’t give out details of Friday’s search. But Derrick Butler said Friday afternoon that detectives from the D.C. police told him it’s likely that his sister’s remains have been washed away by time and the elements. Detectives used cadaver-sniffing dogs along the I-95 Express Lanes between Quantico and Garrisonville Road in Stafford County, Virginia, on Friday to search for Butler’s body. Sources say Jose Rodriguez-Cruz, who pleaded guilty to Butler’s murder in October, identified that location as the spot where he buried his girlfriend. Derrick Butler said that D.C. detectives told him the dogs alerted several times during the search, but that it’s unlikely his sister’s remains can ever be recovered. In 2009, when Butler’s body was disposed of, the median along I-95 in that area was wooded. During the building of the Express Lanes, trees were cut down and rocks and dirt brought in. Derrick Butler said he was told that with time and weather, her remains have been washed away. He said police had “given it a valiant effort,” but that he believes “we’re done” in the search. He added that he was disappointed, but he realized finding his sister’s remains would be a long shot, given the time that has elapsed. Rodriguez-Cruz was sentenced to 12 years in prison for second-degree murder, under the condition he do his best to help authorities locate Butler’s remains. Under the plea agreement, if Rodriguez-Cruz fails to make a good-faith effort to locate the remains, or if he attempts to mislead investigators, the plea deal would be withdrawn, and he would face the original charge of first-degree murder. An earlier search along I-95 in Dumfries was fruitless. When Rodriguez-Cruz pleaded guilty and was sentenced, Butler’s family said finding her remains, so she could be buried, was their prime objective. In October, D.C. prosecutors told a judge Butler and Rodriguez-Cruz argued in the basement of her Brightwood home on Feb. 13, 2009. Rodriguez-Cruz punched Butler in the face, knocking her to the ground, before he straddled and strangled her. Butler said he and his sister had talked about final resting places. Pamela Butler’s family declared her dead in November 2016, before Rodriguez-Cruz was charged with her murder. “We’ve had the memorial service, but we still don’t have the remains,” Butler said. Asked what finding his sister’s remains would mean to him and his mother, Thelma, Butler was at a loss for words. D.C. Police Chief Peter Newsham said earlier in the day via email that he was “very hopeful that we are successful. This family has endured too much for far too long.” He declined Friday afternoon to comment on the results of the search. The Garrisonville Road access points to the Express Lanes were closed for about two hours during the search. They’ve been reopened.